When Carol Lasky first shared her idea for helping people plan their legacy with me, it made perfect sense. 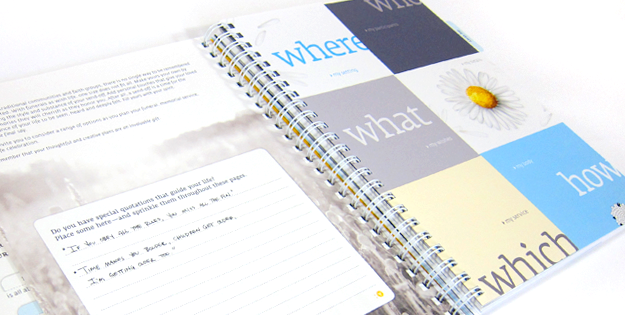 The world needed a creative tool for sharing our plans for the end of life. They also need a friendly community where death can be discussed in a way that isn’t frightening or too technical. Carol was kind enough to send me a copy of Youlo Pages a few months ago. This is a beautifully-designed book that allows for an imaginative, practical recording of an individual’s hopes and dreams for the end of their life. I asked Carol if she would be my first ever guest blogger at Harp Lady at the Hospital and she kindly agreed. Thank you, Carol, for sharing the story of Youlo Pages! They say that the best ideas, entrepreneurial and otherwise, are rooted in childhood. I vividly remember that my parents were very squeamish about the subject of death, having lost relatives to war, illness and Holocaust annihilation. They did their mourning behind closed doors and even forbade us from wearing the color black because of its connections to funerals. That’s why it stuck when my mother breezily mentioned to me one Sunday morning when I was 8 years old that she wanted a particular Mozart concerto to be played at her funeral. She wasn’t thinking about death as much as she was expressing herself and her personal connection to a beautiful piece of music. Now, a member of the baby boomer generation and having arrived at an age that I never imagined possible, I’m thinking about death in a personal as well as cultural context. Societally, we know that 75% of Americans have not spelled out their ultimate wishes to anyone — including themselves. Yet, evidence abounds of new departures (so to speak) around Death. Palliative medicine is placing new priority on end-of-life conversations. The home funeral movement is becoming increasingly popular, following the growth and expansion of green funeral practices. A new company is offering to drop cremains from orbiting satellites, and another offers to stuff them into bowling balls. “Funeral music” is one of the most popularly requested online searches. A new reality show on TLC emphasizes the “fun” in “funerals.” In so many ways, people are increasingly willing — and eager — to share their stories, “last words” and personal intentions for remembrance and celebration. My own personal favorite part of our legacy planner is toward the back. We’ve included a set of cards for designating the most personal of gifts — things like signed baseballs, handmade quilts, recipe collections, the kinds of items that don’t end up in a legal will. The cards are filled out and placed in a special envelope for safekeeping. 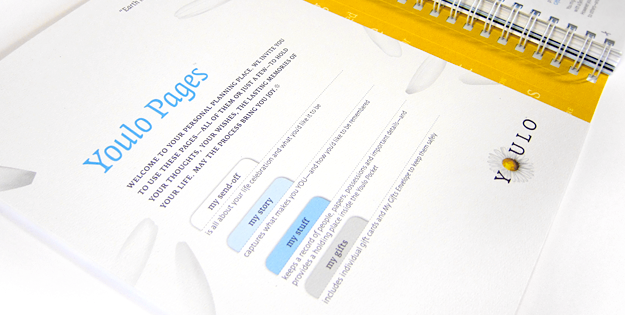 That’s really what Youlo Pages is all about: giving the gift of understanding. I have another memory. It isn’t from childhood but from the death of my father two years ago. When Dad turned 90, we asked him to tell his life stories to a young journalism student that we knew. Over the course of a week, he regaled her with tales of his “lucky life.” In his last days, he was nourished by his words being read back to him by my sister. They are the finest things he could have left us. We invite you to explore Youlo.gy and Youlo Pages online: youlo.gy and youlopages.com. Your feedback is warmly welcome! Carol Lasky, the Creative Director at Boston-based design firm Cahoots Design, is a brand strategy specialist. She co-founded Youlo with her son Colin Mills (Yale, ’13), making the venture intergenerational in fact as well as intention. Youlo Pages, the debut product, is the outgrowth of enlightening conversations with leaders of faith communities, spiritual advisors, healthcare practitioners, financial and legal planners, life coaches, family members and friends.